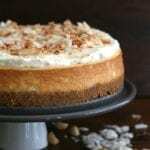 This coconut cheesecake has a macadamia nut crust and is unbelievably creamy and rich. 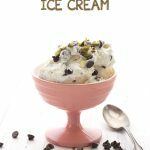 It’s a low carb dessert that’s as tasty as it is beautiful, and is sure to impress your friends! Keto and sugar-free, this is the best coconut cheesecake you will ever eat. I first created this gorgeous coconut cheesecake back in 2014 and it stands the test of time. 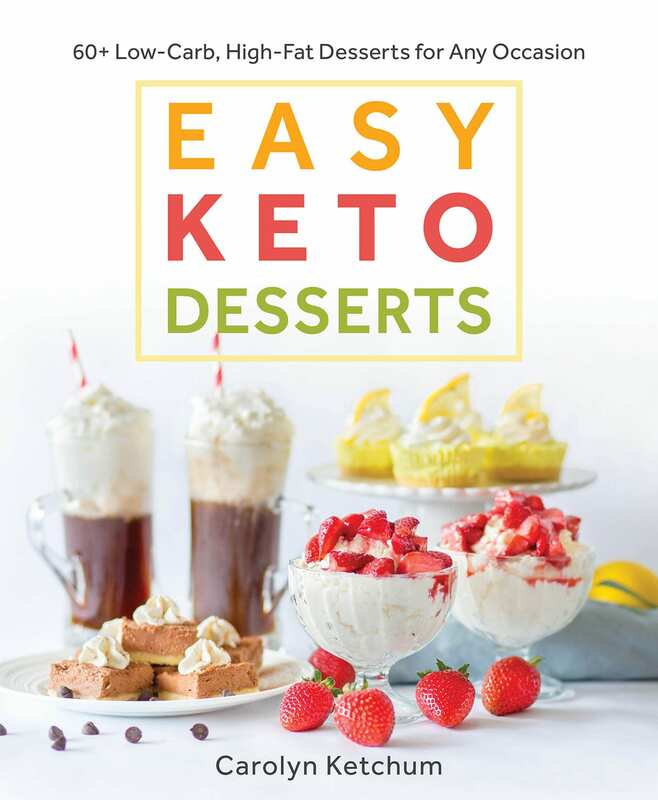 One of the most loved keto cheesecake recipes here on All Day I Dream About Food. If you love coconut desserts, this will be a dream come true. Also try my coconut milk pudding or my coconut cream poke cake. I am a grown woman with an excellent education and I can be extremely well spoken when need be. 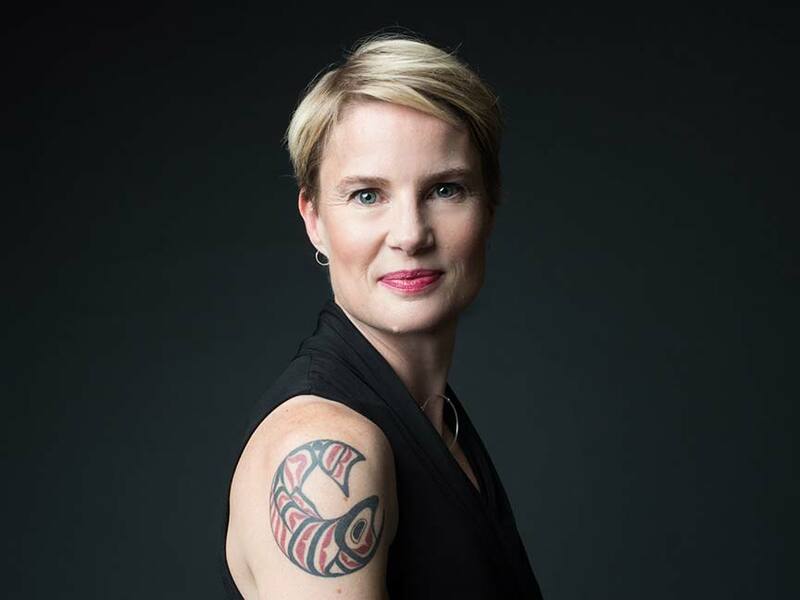 Put me in a formal setting or stand me up in front of an audience and I will mind my P’s and Q’s and speak like the intelligent being that I am. Make me angry and I will get very formal and very haughty and wither you with proper sentence construction and large, intimidating words. But the truth is that I really prefer to sprinkle my speech with colloquialisms and slang. Here I am, 41 years of age, and I throw around the term “Dude!” like it’s going out of style. Seriously, dude, I use it all the time. It peppers my informal speech constantly, as do other 80’s slang terms like “totally” and “psyched”. And I certainly don’t limit myself to any particular decade of slang. I pick up slang and colloquialisms from any generation and use them happily if they suit my purpose. I am a very expressive person and I feel like these words help me emphasize my point sometimes. Besides, they are just fun to say. I suspect I will be 80 and still saying “Dude!” when it feels like the right thing to say. So when I saw that my friend Roxana was organizing bloggers for National Cheesecake Day, I believe my first words were “Hellz Yeah!”. And you know it’s true: hellz yeah is the only appropriate response to an invitation to take part in a celebration for cheesecake, whether it’s low carb cheesecake or not. Normally I pay little mind to these made up food holidays, but low carb cheesecake recipes are a very important part of my life, so I must honour the holiday appropriately. Not only must I honour it, but I must bow before it as the ultimate keto dessert. I mean, it’s cake, but it’s made with cheese and eggs and cream. As long as you can alter the crust and replace the sweetener, it’s an easy recipe makeover. Done right, it looks, tastes and feels just like the real thing. It IS the real thing, because let’s face it, using other sweeteners and making a nut crust is not making a fake cheesecake. It’s making a real and yet a healthier low carb cheesecake recipe. Rock on, dude! So for a moment, let’s discuss this particular cheesecake here, this Coconut Cheesecake with Macadamia Nut Crust. This one, my friends, is a thing of beauty, both inside and out. It’s the ambrosia of the gods. It is heaven on earth. It is, to get all colloquial on you, “Da Bomb”. I mean, almost all cheesecake is good, but coconut cheesecake is exceptional. The texture was spot on, the filling seemed light and somewhat airy and yet was rich and creamy. The macadamia crust had a delicious crunch that offset the creamy filling. And the topping was whipped cream and toasted coconut. What’s not to love about that? Springform pan – these are essential for a good cheesecake, so do yourself a favor and get one! Cream cheese – and plenty of it! 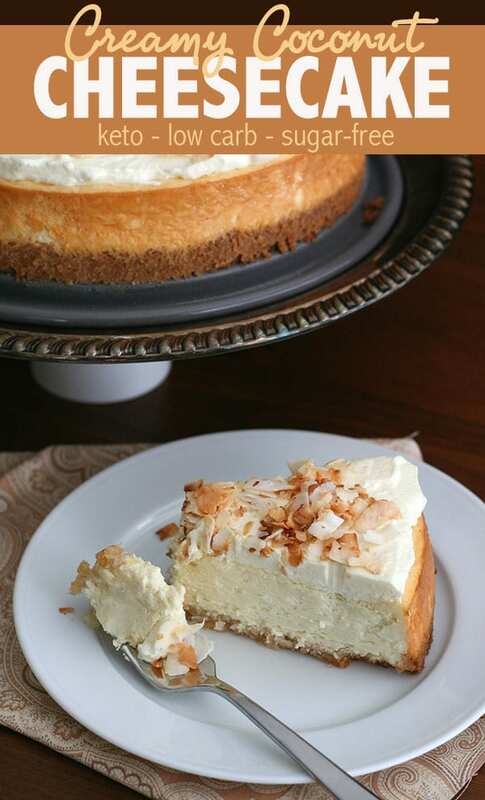 This coconut cheesecake with macadamia nut crust is the perfect low carb cheesecake recipe to celebrate any occasion. 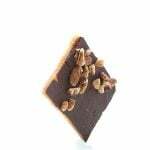 It’s a sugar free and grain free dessert that’s as tasty as it is beautiful. This reminds me of my favorite cheesecake from The Cheesecake Factory…except a whole lot better for me. I am going to eat this for all the days. Pinned! I have a few people who would swoon over this! Great job! Wowzers! This looks so good! I know a few people in my family who would go nuts over it! Hellz Yeah is the right answers when it comes to chocolate! Its my favorite dessert and love your tropical inspiration. Macadamia and coconut go so well together! Thanks for joining us Carolyn! DUDE. You had me at macadamia nut crust. 🙂 Seriously, that’s the crust of the cheesecake on our wedding cake. I still think about it! This is, like, the best cake ever – and it’s low carb. Seriously I love you. And the photos. STUNNING. 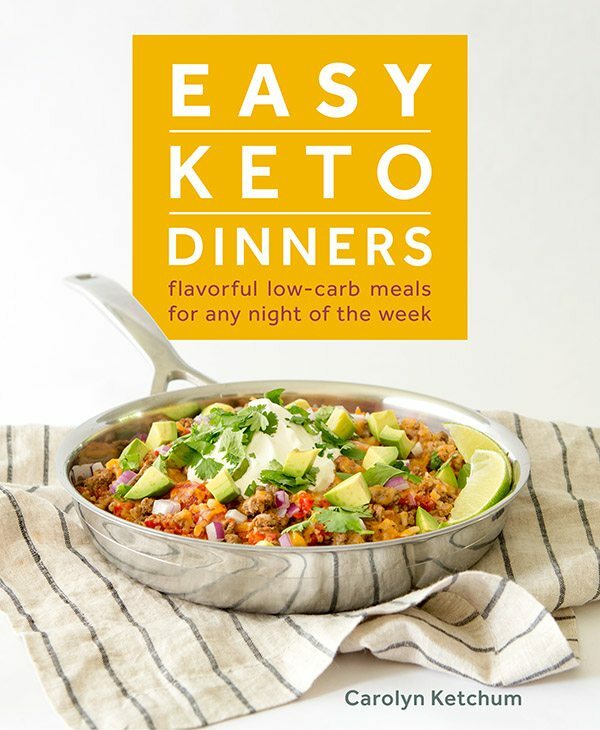 Having trouble figuring out how you are getting <5 net carbs. I input exact ingredients on myfitnesspal and I am getting 20g carbs!!! I'm new to this. It’s because of the erythritol, which technically has carbs but they don’t ever enter the bloodstream so they are non-effective. I have stated many times on this website that I don’t count them. They should be subtracted from the net carbs, just like fiber, because they don’t create an insulin response. Thanks for clearing that up for me. I’ve only been doing this for two weeks and I have tons to learn!!! Btw, I made this coconut cheesecake yesterday and it was delicious!!!! I shared it with 4 friends and they loved it as well. Great recipe. Thank you! Is there a reason you line the bottom of the springform pan with foil? Those macadamia nuts have lots of oil and it can sometimes drip out through the cracks. Keto is it 2 lbs of cream cheese or 3 8oz packages? It’s one and a half pounds, which is equal to 3 8-ounce packages. Today is my mom’s birthday…guess what she is getting for her present? This!! Thanks, I can’t wait to try it. Wonderful! One little bit of advice…make sure you put the cheesecake on a cookie sheet. Even with a really good springform pan, the oils can leak out a bit and you don’t want a mess in your oven! Thanks for the tip! It is in the oven and now I can’t wait for dessert tonight. So THAT’S why I had an oven fire!! I made a nut crust cheesecake last week in a spingform pan and ended up having a house full of smoke and flames shooting out of my oven along with the follow-up mess of baking soda all over the oven (to put out said flames)! Could NOT figure out what had “spilled” because it was an oily residue, not a liquid mess. Thanks so much for the good tip! 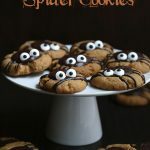 We will be making this soon! You da Bomb Diggity, Carolyn! 🙂 Yep, I had a similar problem when I baked some mini cheesecakes one time. Now I always, always put a cookie sheet under. It’s the nut flours and the oil from the cheese too and even with my really good Kaiser pan, it leaks out a bit. Dude, I am totally loving this cheesecake! lol No seriously, this cheesecake – wow! Gorgeous! Now why have I NEVER made a coconut cheesecake???? It needs to happen ASAP! Yours looks amazing, Carolyn! Coconut and macadamia nuts? Yes, please! Love the nutty crust! I’d probably be happy just eating the crust, it looks SO good! You’ve outdone yourself again, Carolyn! This is simply stunning! Good Lawdy this looks amazing!!! OK you had me at coconut and then at macadamia and at low carb. Pure genius! This sounds heavenly! Love the macadamia nut crust! Hahahaha! My six year old says “dude” ALL the time 🙂 Guess where he gets it? I love this cheesecake! What an awesome combo. I am LOVING coconut these days. Pinned! I’m a “dude” user too! I refer to my 2 sons as dudes constantly. Reminds me of the TMNT…might chuck in a cowabunga for good measure!! Lovely dessert!! We are children of the 80s! Aww hellz yeah dude! I totally echo your sentiments about cheesecake day!! And yours looks fabulous – coconut and macadamia nuts are so delicious together. Plus it is low carb?! Amazing! Happy Cheesecake Day! You have got my full attention with this stunning cheesecake!!! Ermehgerd! This looks amazing! My birthday is in a couple weeks and I’ve found the low carb, gluten free, sugar free dessert that I’m making for myself! (Yeah its this!) I’m continually impressed by your blog and recipes, and constantly get excited about new delicious things to make. Dude! Wow, this looks amazing! My birthday is next week and this just may be my present to myself! And I just bought a bag of macadamia nuts – karma! I like all things cheesecake and I adore the flavor of macadamia nuts, so I’m sure this is just wonderful. 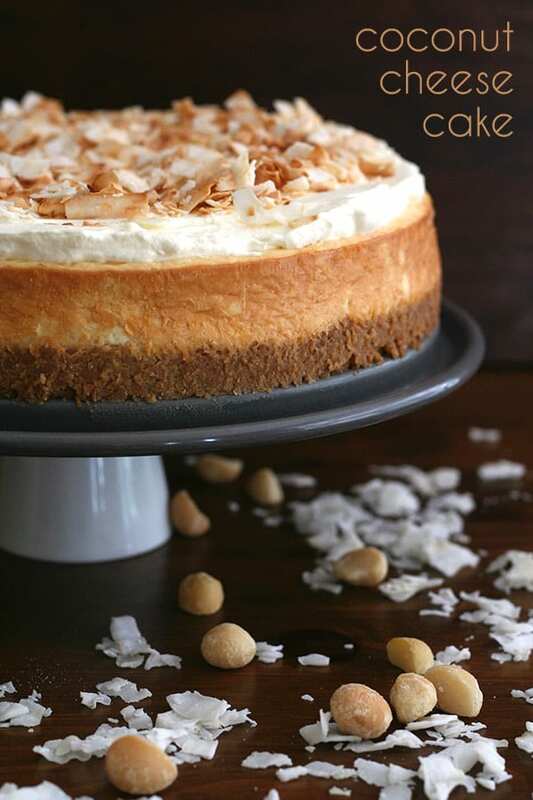 Love the macadamia crust you came up with – cheesecake is one of my husband’s favorites! Oh Dudette – that cake rocks!! I really shouldn’t look at your site right before lunch at work. I wanna make it and eat it NOW! Um…hellz to the yes, please. LOVE the healthier subs here–and I love how you write, Carolyn! It’s such a privilege to meet you through cheesecake day, which is the best excuse ever for bloggers to gather without sponsors or anything else except tons of cheesecake love. 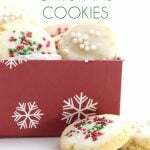 So glad we could both be a part of it and that I could drool over this gorgeous recipe! Thanks, Ala! I will check out your cheesecake too. There are so many of us, it’s hard to get to everyone. Would sugar be ok or would that alter it too much? I’m pretty sure my reaction to your coconut cheesecake was hellz yeah 😉 I also say dude and guys a lot, even when I’m talking to all women. Can’t wait to try your cheesecake. 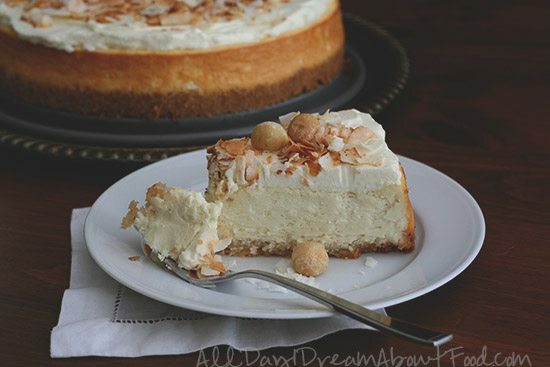 I love this gorgeous cheesecake. . love the macadamia crust and the toasted coconut on top. . I still need to bake with my Swerve!! Ah coconut!! LOVE. 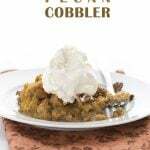 And even better than this is low carb and much better for me than a slice of Cheesecake Factory or cheesecake from any other restaurant for that matter. Yum! i am craving a slice of this cheesecake so bad.. looks delicious, never tried cheesecake with a macadamia crust before! Coconut is my weakness for SURE! I’d love a slice (or 3) of this with my morning coffee please! Dude! This is one gorgeous cheesecake. I love the flavor combo and the toasted coconut on top is so pretty. Thank you for this! I just made it and it is incredibly delicious and beautiful. I can’t believe it’s low carb! I will make this again. 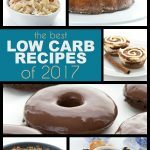 Recipes like this help me stay the low carb course. This crust is AMAZING. I had two dying bananas, so opted to make a low carb Banana Cream Pie on top of this crust. I will have to make your cheesecake verson at some other time. Always love your recipes, thanks for taking the hard work out of low carbing. Oh my goodness, this cheesecake is so good! I just had my first bite and, dude, they must have this in heaven! Thanks for the recipe, the whole family enjoyed it so much. What amounts of sweetener would you use with regular sugar, or wondering what coconut sugar would do in this? Swerve measures like sugar so you can just replace it directly. How far ahead can this cheesecake be made i.e. prior to consumption? Has anyone tried to freeze it? I have had great success freezing traditional cheesecakes, just not sure with the mac crust. Looks fabulous and perfect for my celiac nieces! Thanks. Hello moderator. Posted a question but mistyped my email address and didn’t realize until after I hit “send”. Mea culpa and please send notifications of comments to the correct email. Sorry and thank you. 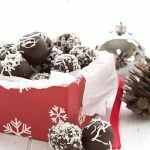 Original question was how far in advance can this recipe be prepared and anyone have any experience with freezing this recipe? Thanks! Looks fabulous! I think it would probably freeze just fine. This is one of the very best recipes I’ve ever made… LC or not! I made it for our New Year’s Eve get together with non-LCer’s, including four teen-ish boys. Everyone went back for more. Just sad that I had none leftover. 🙂 Thanks for this recipe! Thanks for the great recipe. I made this and the cheesecake was amazing but I thought the crust of macadamia nuts was a little over powering. Next time I make this I will use pecans for the crust. 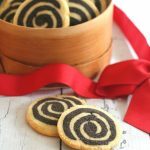 What can you substitute for Swerve, I don’t have any and haven’t made the investment to buy online yet.. but I would love to try this recipe! Currently, I have liquid Stevia, Splenda & Xylitol – that is pretty much all I can find locally. Can regular sugar or honey be used in place of the Swerve Sweetener? What would the measurements be for those? I don’t use sugar, so I can’t be sure but you should be able to sub it in in equal amounts. Honey would add too much liquid content. Thanks for the quick response. Not being familiar with Swerve I wasn’t sure if it was similar to Stevia, etc, where the amounts used are much smaller than sugar. Swerve is designed to measure cup for cup like sugar. So that should help! Thanks so much Carolyn, we are off to Maui in a few weeks and I am going to make this while there! It looks amazing! Any suggestions to replace the swerve sweetener? Would Agave or some other sweetener work? Thanks! 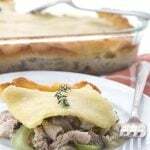 Looks amazing– hoping to make for Easter dinner! You can use any sweetener although liquid sweeteners like agave will introduce more moisture. Thank you so much for posting all these great recipes, this cheesecake is indeed delish! I have one question regarding using granular erythritol isntead of swerve for the filling. I noticed that cooling effect after taste once the cake gets refrigerated, read several posts of people having same issue where granular erythritol gets re-crystallized after baking causing this noticeable taste. Is this the same whether we use swerve or any other brand of granular erythritol? Some recommend powdering it to prevent it from re-crystallizing, hence avoiding that problem. Your thoughts and other readers are greatly appreciated! I stopped using straight erythritol because of that cooling effect. For me, Swerve has none of it and is less likely to recrystallize as well. Some people still experience the cooling with it, but I don’t at all and most people also don’t. I hope that helps! I have to say that this crust is the best crust I have ever tasted! I used coconut oil instead of macadamia oil. The cheesecake and topping were also excellent. Well done! No need for boring food in the low carb lifestyle. I am sharing this on my website. 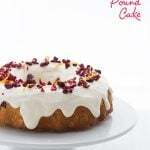 Anyone make this with low fat cream cheese? I did. I just took it out of the oven after 2 hours because the top was burning, but the cheesecake wouldn’t stop jiggling. I hope it sets up when it cools completely. The cheesecake is not supposed to stop jiggling. Two hours is much too long. The center should still jiggle slightly. Oh, I see…low fat cream cheese. Yep, that would be the problem. Delicious cheesecake! The crust was the absolutely divine! I’ll be using it for other recipes that call for crust. This cheesecake got even better days after I made it. Husband approved, even, and that’s a tall order in the low carb realm. It could have been somewhat sweeter, but wasn’t sure if I could add more swerve or not. Any thoughts? Thanks, Carolyn, for such a great recipe. 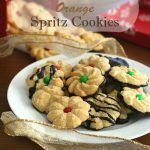 It will be my go to dessert to bring to gatherings. A real quality dessert. Sure, if you like things sweeter, you could add more swerve or even a little stevia to ramp up the sweetness. Planning on making this for a dinner and can’t wait! Unfortunately we don’t have any macadamia nuts where I live, I was wondering if the crust could be made substituting the macadamia nuts with cashews or some other nut? I appreciate the help and the recipe! You can use any nut but macadamias have more oil so you may need to add a little extra butter to the crust. I love cheesecake. I have made this twice (eating some later today) and it was amazing. I do have a question about the nutritional content. Like many I use myfitnesspal to log what I eat. When I do a bulk import of the ingredients and specify 16 servings, then I enter 1 serving it has around 21 carbs but your description has 8.9 carbs per 1/16 slice. Do you think it’s in the way that the app calculates the ingredients? I’d rather input a serving as part of the recipe but the numbers seem way off from what you’ve listed. I’m still eating it either way LOL. Nope, it’s the erythritol (Swerve). It technically has carbs but they never enter the bloodstream and are excreted whole in the urine so they don’t “count” and I don’t add them. I’ve tested this on myself numerous times, as I am pre-diabetic and it never moves the needle on my blood sugar. There is a print button right on the recipe itself, right at the top right corner. This looks amazing and I plan on using it as a birthday cake while on vacation with her family who is not low-carb. However I am actually having the opposite problem of most people that when I put the info into my fitness pal I am getting a total carb count per 1/16th slice of 4. Now I’m not complaining at all as that is wonderful, but we do 20 g of total carbs or less per day and I’m wondering how you got eight? Don’t want to accidentally overshoot. I used MacGourmet and I am pretty confident of my numbers on this one. But maybe you should split the difference, just in case? This will now be a new tradition for our family. My first cheesecake ever! I did substitute Coconut Palm Sugar for the Swerve, making it a tan color. Also, I doubled the whipped topping. My son & daughter in law are Gluten Free and they absolutely loved it. Thanks for sharing! Hi, could I use sugar instead of the sweetner? If so, how much would I use? You can sub it in cup for cup. Could I use part or all mascarpone cheese instead of cream cheese? I really have no idea, I didn’t try. But mascarpone isn’t really the same and I’d be worried about the texture. If you’re just using regular sugar instead of sweetener is it the same amount?? Can you substitute with Splenda or stevia? Probably, but I haven’t tried those myself so I can’t guarantee the results. I can answer that question as I used Splenda in all my cheesecakes on this site. Works great…except when doing a chocolate crust with cocoa powder it is a bit bitter….but we like the contrast with the sweet filling. Are powdered swerve and swerve sweetener two different things? Your recipe has two different Swerve? Yes, one is granular and the other is powdered. Like icing sugar. Making this for the third time tonight (for my art and philosophy class tomorrow – it’s my turn) in Stellenbosch, South Africa. Your cheesecake sure gets around… ? Thanks for this great recipe. Yum! This cheesecake is the most delicious one yet. We loved it the way it was but Today I remade it….had a pan of German Chocolate brownies from this website that we thought were a bit dry….decided to repurpose them as a crust for this cheesecake and added shredded unsweetened coconut and sugarfree chocolate chips to the batter. Still in the oven, but I am sure it will be the bomb!!! This sounds amazing! 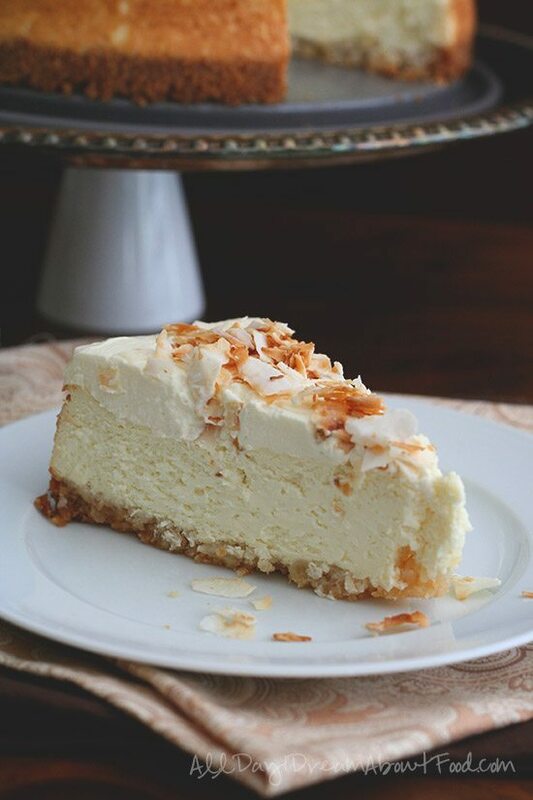 I love coconut and cheesecake, but I never thought about combining the two! Awesome idea! 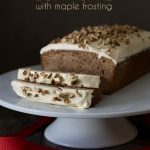 I made this for my birthday cake yesterday, and I wanted to thank you for publishing such a delicious recipe! I am one of those who can still taste erythritol in Swerve, so I was honestly stressed about serving this to our extended family. They all raved about it being a wonderful cheesecake, and I had very little of the cooling effect so I was totally thrilled! I used the smallest suggested amounts of Swerve in your recipe, and I probably would be fine leaving more out of the whipped topping and the crust. The topping was such a blessing – when I pulled open the refrigerator to top and dress the cake, I found my son’s water bottle pressed deep into the plastic covering the cheesecake. Thankfully there was enough topping to fill in the space and still look like a generous layer, so many thanks there! Yay so glad this met with approval and that the topping saved the cake! Could I use a graham crust ? Or any other suggestions? Macadamia nuts here in Canada are outrageous price! Don’t use graham! Too many carbs. But you can try almonds instead. Hi Carolyn, What kind of macadamia nuts did you use and where can I get them? All I seen here is dry roasted or salted ones. Looking forward to making it…thanks for all your great recipes! I got raw ones at Trader Joe’s. Not sure where you are and where you can get them? I live in Long Island NY. We have Trader Joes!!! Thank you! Our Trader Joe’s doesn’t stock them but Winco does. We made this cheesecake this week and it was/is awesome! Even though my whipping cream would not whip (a problem I sometimes experience with the cream I can buy here in Bulawayo, Zimbabwe), I still served it with a bit of sweetened cream over top and the toasted coconut flakes sprinkled on it. I definitely need to get some coconut extract, but it is really, really good. So, thanks! So creamy, Yumm. It reminds me my childhood, when my grandma was making something very similar. This looks so good and I can’t wait to try it. What is Swerve sweetener and how much sugar would I use to replace it? I don’t do any kind of sweeteners except for the odd bit of stevia. I think they are worse poison than sugar. Just to be clear, Swerve is not an artificial sweetener like Splenda is. But as you wish…use the same amount of sugar, since Swerve measures like sugar. So what if I accidentally put a whole cup of coconut milk in the mixture?? I can’t believe I just did this! Can I add more cream cheese? Help! I guess more cream cheese and maybe another egg? I want to make a much smaller version of this and make it in individual ramekins. Do you think that will work? I only need 8 so thinking of cutting the recipe in half. I have a steam oven so will bake in there. Using your method and thinking of individual ones, how much would you cut your time back by? Can I use Xylitol instead of swerve? If so do I use the same quantity? You should be able to sub it in equal amounts, although it’s less sweet so you may want to taste as you go. I know its been years since you posted this, but I just started Keto. I made it with an almond crust based on your other recipes, and did 1 and 1/4th cup almond flower and 3/4 cup unsweetened coconut. The only other change is that I used a different sweeter, some monk fruit non-sense I like a little better than stevia. Its fantastic, thank you for posting! So glad you liked it. And welcome to Keto! I’ve never bought canned coconut milk, is it the same as the box kind they sell at the grocery store? I want to make this today but only have 1/2 c Swerve. Would it be okay to use 1/2 c Pyure to make up the difference. That should work for the filling. It will keep for up to a week but yes, it should freeze well too. Made this on the weekend – it was delicious! I altered the sweetener a bit but even my mum who isn’t keto loved it. The only issue is my base stuck to the baking paper so as I removed each slice it fell apart. Any suggestions? I’m wondering if I didn’t cook the base enough? Or did I have to remove the base from the paper once it cooled and before I made the rest of the cheesecake? I don’t know anyone else who’s had that issue. Maybe you need to grease the paper? Maybe? I thought the butter would be enough. I’ll try grease the paper this weekend and also cooking it more (when I removed it from the oven, half was much darker than the other side so I was worried it was almost beginning to burn but it seems that this size isn’t falling apart as much so maybe it was under cooked). Thank you! My recipe doesn’t have any parchment paper so I am curious why you put some down. That may actually have caused the issue, not really sure. Well that will be the issue then! I didn’t have foil so I used baking paper. Makes sense, I forgot that I changed that around. I’ll try foil on the weekend 🙂 Thank you! Oh, I see. No you don’t like the pan with foil. You wrap the whole outside of the pan in foil so the oils don’t drip into your oven. That’s all! I just wanted to mention that I have a tree nut allergy, so I subbed in pine nuts in place of the macadamia nuts and it was fantastic! Macro and texture-wise they are very similar (pine nuts have a tiny bit less fat, a few more net carbs and more protein). I can’t wait to make this again, it was so delicious! Oh–I also omitted the butter in my pine nut crust. It was pretty oily already and turned out perfect. It held together great and had a nice bit of crunch. If I choose to use regular sugar-are the amount the same throughout the recipe??? I have made this cheesecake and loved but looking for something more portable and individualized. Would it be possible to make this into cupcakes? Yes but I think it would make a LOT of them. More than 12, because the filling is significant for a full size cheesecake. I could consider halving the recipe and seeing how many that made. Thank you, I will try that and follow up with the results. Made this yesterday for my Aunt’so 90th Birthday. Delicious! Your site is amazing and you are a fantastic writer. I had to laugh at your introduction because I totally relate. I have a B.S. in education and people are taken aback at my sense of humor. Regardless, this cheese cake recipe looks and sounds amazing! I will try it for sure. Haha, thank you. I had to go back and read what I wrote…dude. The information is all there in the recipe. I am so excited to try this! Do you think I could use roasted salted macadamia nuts instead of he raw and just omit the salt from the crust? It might be a bit on the salty side but yes. Awesome, thank you! Also, what size is your spring form pan you used? I am new to your blog. Someone made this cheesecake cake yesterday or Friday and gave me a slice. Never in my life have I liked cream cheese. I have made many cheesecakes for my family. I never cared for them. Wellll, I tasted of this and oh my goodness, I was shocked. I LOVED it! She had used lactose free cream cheese for her benefit. The crust was super! I am hooked! No one believed I loved it. We had just left a birthday party with a decorated cake but I couldn’t eat it. I sure ate this cheesecake when I got home. You say “they” but it’s only one cake…did you try to make it into several smaller ones? Hello!! I just got home with ingredients to make this and I only have pwdered swerve and just enough. Could I use Truvia in place of the granulated swerve this time. Next time I will use Swerve. You can use powdered Swerve for all of this, if you have enough. Truvia would be fine too but I think it’s 2x as sweet so cut back on it. I made this for Super Bowl and it was a hit. Delicious with a lovely texture. I used sugar at the same measurements and it was a perfect sweetness. Love everything about this, but that crust sounds incredible! I’m almost 41 (next week) and I use “DUDE” ALL THE TIME! It was what I was known for at my old job. While I’m not a coconut fan (though I am learning to appreciate it), my Mom is and she loves cheesecake too! Can’t wait to make this for her! Cheesecake is my FAV. I want! That is one perfect cheesecake!! I made this for a family get-together to celebrate my daughter’s birthday. We are both doing keto and this was my first attempt at a keto dessert. It turned out absolutely perfect!!! Thank you so much for the amazing recipe!!! If you do t have a spring form pan can you use something else . This really needs a springform pan to come out properly. I made this coconut cheesecake for my birthday and the flavour was absolutely mind-blowing!! The only thing that was bad about it was that the base remained soggy, but honestly, the cheesecake was so good that I didn’t really care. Should I only use one tablespoon of oil next time? How would this one fare in the Instant Pot? Thoughts? I’m willing to convert for smaller size and try if you think it may work! I am sure it would be fine but you will need to figure out the amounts yourself based on my other instant pot cheesecakes. Made it for my father’s & sister’s surprise birthday which fell on the same week as Father’s Day. Triple celebration with the most fabulous cheesecake out there. We love coconut. We love Macadamia. Pair those two together. DA BOMB!! We’ve decided to eat the cake slowly, but everything was gone the next day! Irresistible. 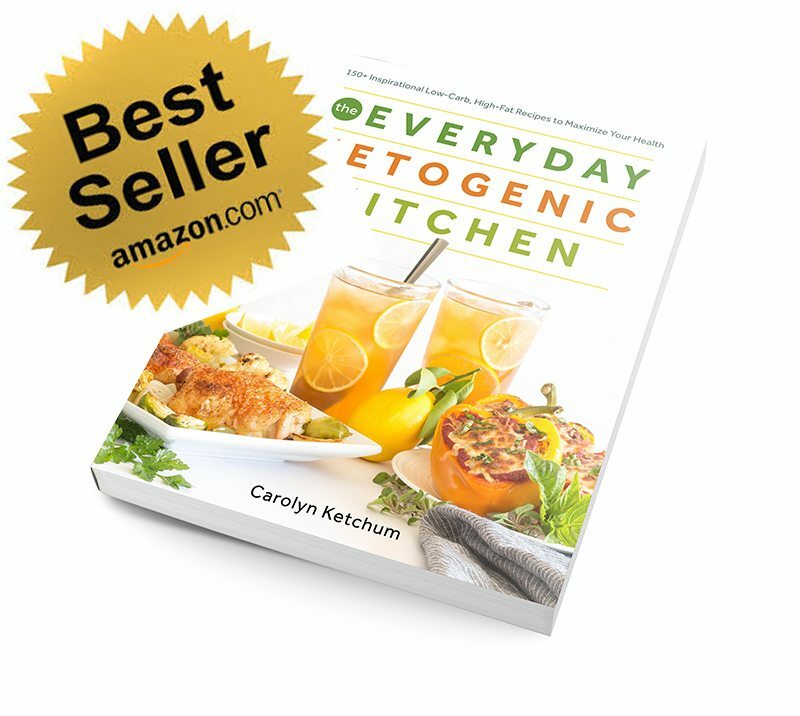 Thank you so much for sharing amazing recipes with us. You rock! Wow this looks amazing! Can’t wait to try it out! Give me ALL THE CHEESECAKE!!!! YESS!!!! 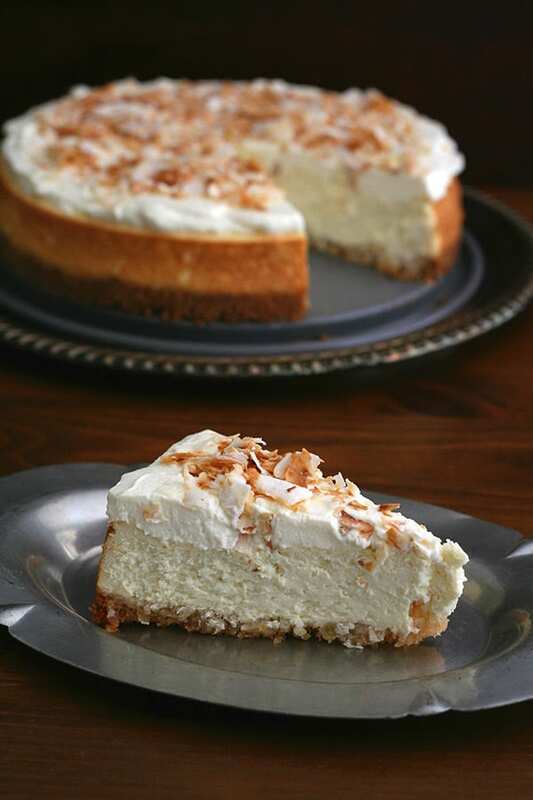 This coconut cheesecake with amazing crust sounds too good to be true! Oh my goodness! I’d be all over this cheesecake. I love these flavors! These are two of my favorite flavors! Such a smart idea to put them together into a cheesecake!! Yummy!! I was wondering if it would be possible to make individual servings of this? And how I would alter the ingredients. Thanks! I doubled this recipe and made two cheese cakes. I took one to a pot luck at work and everyone loved it! Definitely a keeper! Do you use just the cream part of the coconut milk? Or should I mix up the can and use a mixture of both the liquid and the cream? I’ve made this before and it’s excellent–just can’t remember now what I did. Eeek. Has anyone tried cooking this in an instant pot? If so, what time did you use? can swap sweetner with monkfruit? also, could dairy cream replace coconut cream? If by “monk fruit” you mean Lakanto (which is mostly erythritol), then yes. I would stick with the coconut cream, however, for maximum coconut flavor.